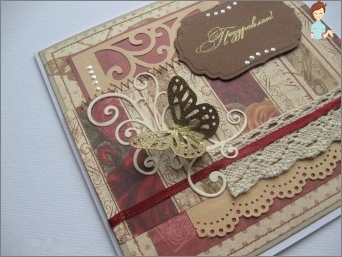 Hot embossing and scrapbooking - what is it? Do you like to do needlework and want to try a new technique that you have not tested? 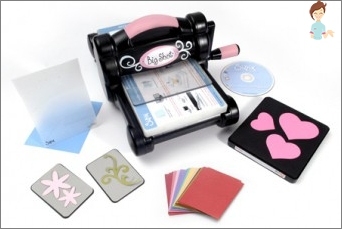 Hence, hot embossing and scrapbooking is just for you! Needlework is just that painstaking andA creative activity that helps to abstract from stress, everyday burdens and nervous tension. Almost all varieties of creative work require certain skills and abilities from a person, but there are also those with which even a beginner is relieved. Embossing is exactly the option that everyone can do. In scrapbooking, this method is used to create volumetric patterns. In fact, with an improvised device on the right basis, an embossed image of a previously prepared pattern appears. The technique can be implemented wet or dry. The finished product gives uniqueness to cute trinkets and helps decorate the apartment. Special rod of metal, at the end of which is attached a ball. The latter can have a different size. The smallest tips are used to realize very thin elements of the pattern. It will also require a specially designed embossing dryer, which provides airflow of low speed and high temperature. Beginning needlewomen often worry about the issueOf what to replace the hair dryer for embossing? And not without reason, after all the device is expensive enough, and it is not necessary to use it. On the forums of fans of a similar kind of home creativity, you can find a lot of alternative options. For example, hairdryer Can replace a conventional electric tile, heated to the desired state. Prepared properly prepared takeLong tweezers, and then located a short distance from the heated surface. Also there is a variant to use as a heating device a usual household iron. In any case, you need to beware of possible burns and the formation of tails on a paper basis. Dry stamping: how is this done? "Dry"Embossing in paper scrapbooking is done withUsing specific stencils, which you can buy almost at any store for needlewomen or on the Internet. Engraving on paper, you need to take care of good and proper lighting, which should be fed from below. Therefore, with their own hands, such patterns are made on photostyle or on glass, located on two chairs, and illuminated from below. Paper should be attached byDouble-sided adhesive tape. The combination is located on a glass surface, and with the help of a stylus (an iron rod with a spherical tip) all the elements of the pattern are gently squeezed out. In order not to break through the paper base, it is necessary to work patiently and assiduously. "Wet"Embossing can be done by one's own hands. We start with the fact that the ink must be applied to the substrate, this is done with the help of a specific stamp. That the ink is not smeared, they impregnate the ink pad, which at the same time guarantees the uniform ink layer. 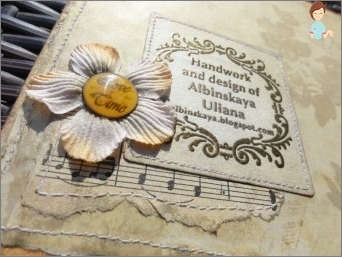 The pattern itself is made on thick paper, which can not be torn due to wetting. Inks are powdered with powder, which can haveDifferent texture and shade. Then you should wait for the complete drying of the workpiece, after which excess powder particles are brushed or cleaned with an antistatic tampon. After that, you can start warming up, which is useful hairdryer. The device should be placed at a distance of 5-7 centimeters from the base with a powdered pattern. Under the influence of high temperature, the powder begins to form a relief. The resulting pattern should be carefully cut andAttach to the final product. The result of the efforts will be to obtain a refined, original and unique decoration, which you can literally justify everything. Being exposed to heat, mottled powder particlesMelted and flowed smoothly on the basis, creating an exclusive pattern. The glitters contained in the powder can have different sizes and shades, creating incredible textures. The most beautiful is the pearl orMatte-white powder, which is used to decorate children's or wedding accessories. Its volumetric analog gives the opportunity to achieve the effect of velvet smoothness, and a smooth and convex relief is obtained by using a transparent powder. The technique of dry or wet embossing is oftenIt is used for decoration of boxes, boxes and other hard surfaces. Sometimes its use gives a chance to get a plane that mimics crocodile skin. In the market of accessories for paper creativityThere are special mechanisms that are usually used by professional masters. These machines can simultaneously provide the technique of embossing and cutting down on paper. Devices can be electrical and mechanical. The first option is very heavy and requires a constant power source, but it is possible to process dense materials by the type of leather or cardboard. Machines are usually completed in additionVarious accessories: chipboards, adapters and so on. Using such adaptations gives the master a real chance not to limit his imagination. Come up, create and give yourself and others incredible beautiful products!